Download "20462C: Administering Microsoft SQL Server Databases"
3 Describe how database transaction logs function, and how they affect database recovery. 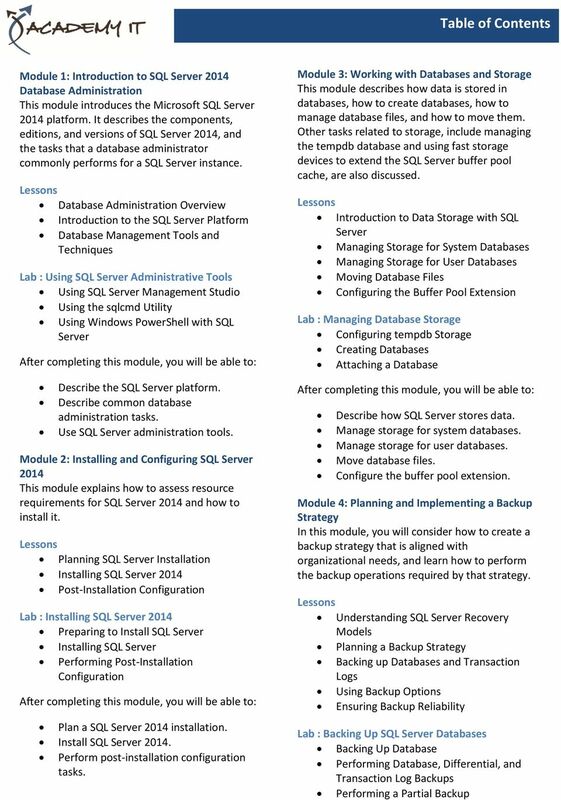 Plan a backup strategy for a SQL Server database. Back up databases and transactions logs. Perform copy-only, compressed, and encrypted backups. Maximize backup reliability. 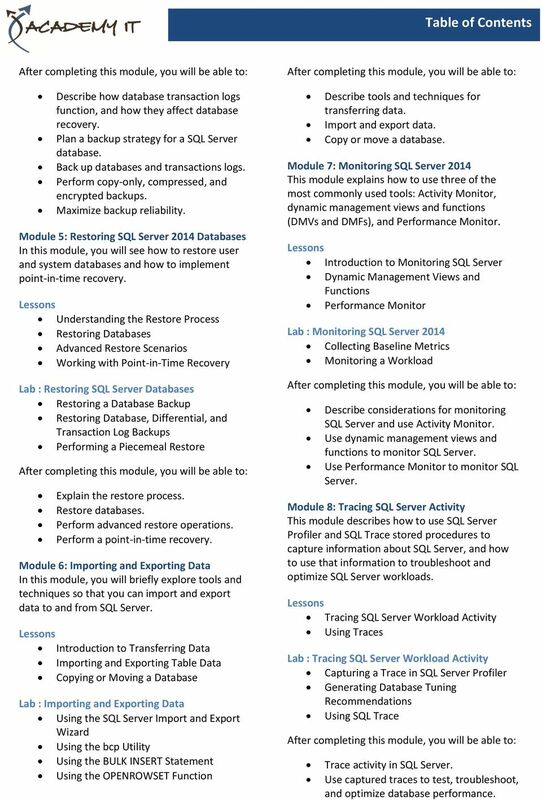 Module 5: Restoring SQL Server 2014 Databases In this module, you will see how to restore user and system databases and how to implement point-in-time recovery. Understanding the Restore Process Restoring Databases Advanced Restore Scenarios Working with Point-in-Time Recovery Lab : Restoring SQL Server Databases Restoring a Database Backup Restoring Database, Differential, and Transaction Log Backups Performing a Piecemeal Restore Explain the restore process. Restore databases. Perform advanced restore operations. Perform a point-in-time recovery. Module 6: Importing and Exporting Data In this module, you will briefly explore tools and techniques so that you can import and export data to and from SQL Server. Introduction to Transferring Data Importing and Exporting Table Data Copying or Moving a Database Lab : Importing and Exporting Data Using the SQL Server Import and Export Wizard Using the bcp Utility Using the BULK INSERT Statement Using the OPENROWSET Function Describe tools and techniques for transferring data. Import and export data. Copy or move a database. Module 7: Monitoring SQL Server 2014 This module explains how to use three of the most commonly used tools: Activity Monitor, dynamic management views and functions (DMVs and DMFs), and Performance Monitor. Introduction to Monitoring SQL Server Dynamic Management Views and Functions Performance Monitor Lab : Monitoring SQL Server 2014 Collecting Baseline Metrics Monitoring a Workload Describe considerations for monitoring SQL Server and use Activity Monitor. Use dynamic management views and functions to monitor SQL Server. Use Performance Monitor to monitor SQL Server. Module 8: Tracing SQL Server Activity This module describes how to use SQL Server Profiler and SQL Trace stored procedures to capture information about SQL Server, and how to use that information to troubleshoot and optimize SQL Server workloads. Tracing SQL Server Workload Activity Using Traces Lab : Tracing SQL Server Workload Activity Capturing a Trace in SQL Server Profiler Generating Database Tuning Recommendations Using SQL Trace Trace activity in SQL Server. Use captured traces to test, troubleshoot, and optimize database performance. 4 Module 9: Managing SQL Server Security In this module, you will be learn about the core concepts on which the SQL Server security architecture is based, and how to manage security at the server and database levels. Introduction to SQL Server Security Managing Server-Level Security Managing Database-Level Principals Managing Database Permissions Lab : Managing SQL Server Security Managing Server-Level Security Managing Database-Level Security Testing Database Access Describe core security concepts in the SQL Server security architecture. Manage server-level security. Manage database-level security principals. Manage database permissions. Module 10: Auditing Data Access and Encrypting Data This module describes the available options for auditing in SQL Server, how to use and manage the SQL Server audit feature, and how to implement encryption. Auditing Data Access in SQL Server Implementing SQL Server Audit Encrypting Databases Lab : Auditing Data Access and Encrypting Data Implementing Auditing Implementing Transparent Database Encryption Describe options for auditing data access. Implement SQL Server audit. Manage SQL Server audit. Implement Transparent Data Encryption. Module 11: Performing Ongoing Database This module describes common database maintenance tasks that a DBA must perform, and demonstrates how to automate these tasks using maintenance plans. Ensuring Database Integrity Maintaining Indexes Automating Routine Database Lab : Performing Ongoing Database Managing Database Integrity Managing Index Fragmentation Implementing a Plan Ensure database integrity by using DBCC CHECKDB. Maintain indexes. Configure Database Plans. 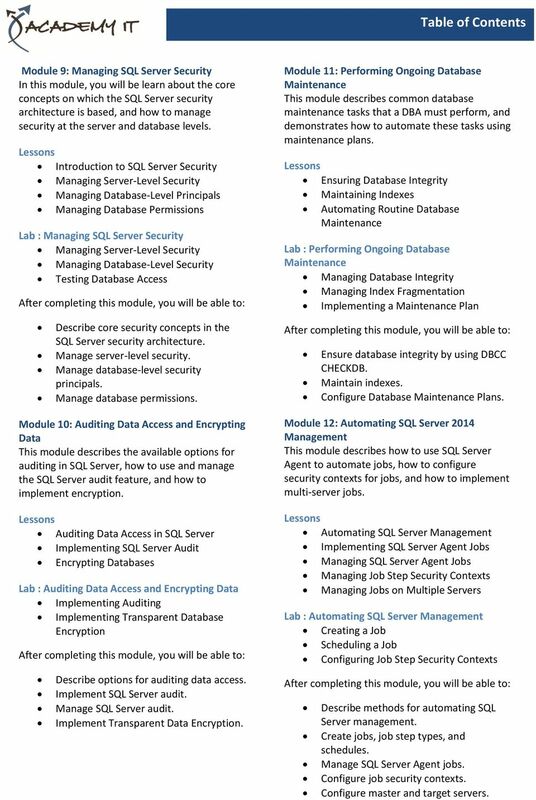 Module 12: Automating SQL Server 2014 Management This module describes how to use SQL Server Agent to automate jobs, how to configure security contexts for jobs, and how to implement multi-server jobs. Automating SQL Server Management Implementing SQL Server Agent Jobs Managing SQL Server Agent Jobs Managing Job Step Security Contexts Managing Jobs on Multiple Servers Lab : Automating SQL Server Management Creating a Job Scheduling a Job Configuring Job Step Security Contexts Describe methods for automating SQL Server management. Create jobs, job step types, and schedules. 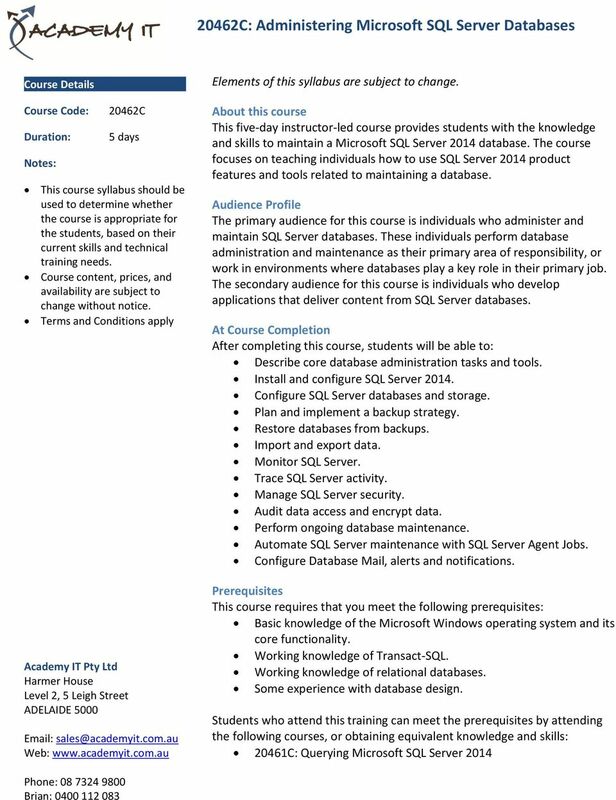 Manage SQL Server Agent jobs. Configure job security contexts. Configure master and target servers. 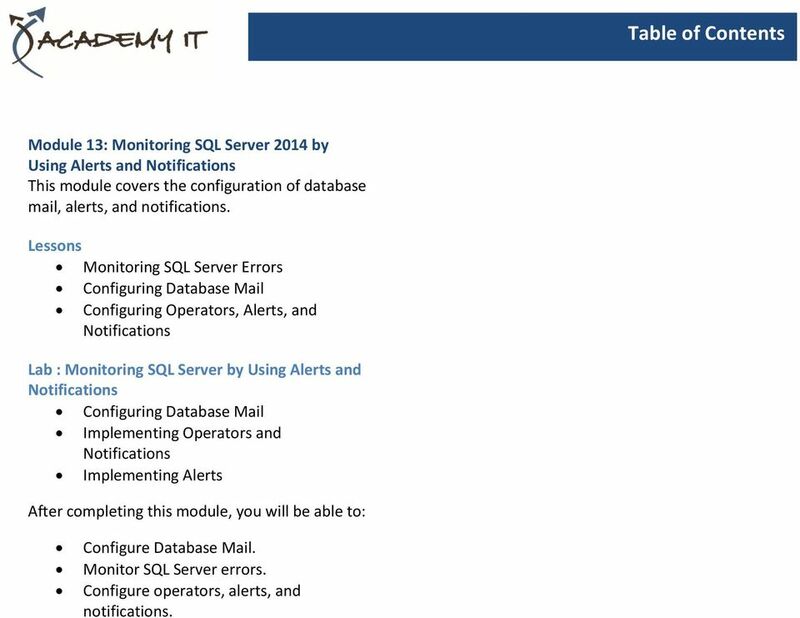 5 Module 13: Monitoring SQL Server 2014 by Using Alerts and This module covers the configuration of database mail, alerts, and notifications. Monitoring SQL Server Errors Configuring Database Mail Configuring Operators, Alerts, and Lab : Monitoring SQL Server by Using Alerts and Configuring Database Mail Implementing Operators and Implementing Alerts Configure Database Mail. Monitor SQL Server errors. Configure operators, alerts, and notifications.